ELIZABETH CITY, NC –– A redesigned exterior comes with the connectivity features you expect and unmatched safety in the 2016 Chevrolet Equinox. The Equinox is everything you love without the sacrifices. 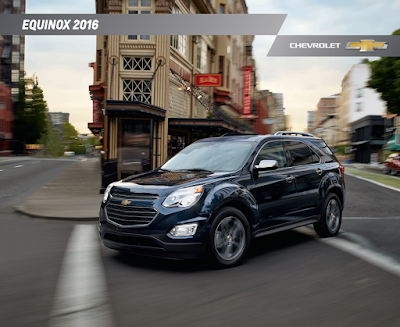 Learn more about the features in the downloadable 2016 Chevrolet Equinox brochure. The newly evolved exterior of the 2016 Chevrolet Equinox pulls in looks with a chrome-accented dual-port grille, 18 inch custom-styled aluminum wheels, and halogen projector-beam headlamps. Good looks continue on the interior with a high-end feel and superior comfort. Generous leg room and Multi-Flex sliding rear seat create versatility and offer more space than the Equinox’s competitors. An Estimated 32 MPG highway will take you far in the Equinox with features like forward collision and side blind zone alert to keep you safe. The 2016 Equinox also comes standard with the technology you’ve come to rely on. A standard USB port is available for plugging in music or keeping devices charged while you’re on the go. OnStar 4G LTE Wi-Fi can keep you reliably connected on the road. The 7-inch color touch screen comes with Sirius XM, Chevrolet MyLink, and is compatible with your smartphone. Download the brochure to see more photos and features you might want, then stop by Perry Auto Group to purchase or lease your 2016 Chevrolet Equinox. Perry Auto Group has two dealership locations to serve you better at 1005 W. Ehringhaus St, Elizabeth City, NC, 27909 or 1001 Halstead Blvd Elizabeth City, NC 27909. Stop in for any of your auto or community needs, or feel free to give us a call at (252) 338-9100.